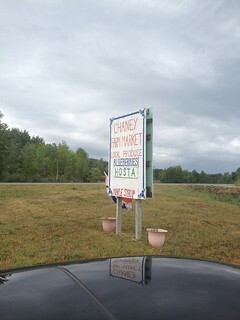 It's been over two months since I last posted an entry for last summer's road trip. There are a variety of reasons, of which the largest two are that I've been spending a lot of my creative energy on Apple instead of writing over the past year, and I started playing World of Warcraft again. But I want to return to the habit of chronicling our trips. So to clear the way for an upcoming trip, I want to finish this one. Perhaps another reason that I've been slow to write about that last Friday is that this was the day that we felt we were really heading back to home and non-vacation life. We'd turned eastward on the previous Saturday, but this day meant that we would be spending the night in Ohio, which feels very close to home. The weather reflected this too; this was the first day of our trip that it rained on us, starting with dampness in the morning and getting heavier later in the day. 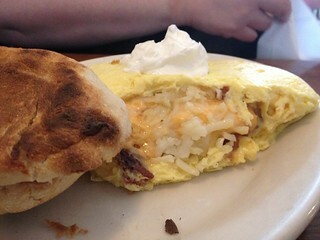 We breakfasted at a place in Gaylord called Diana's Delights, which I think was pretty good though even though I feel unenthusiastic about it. 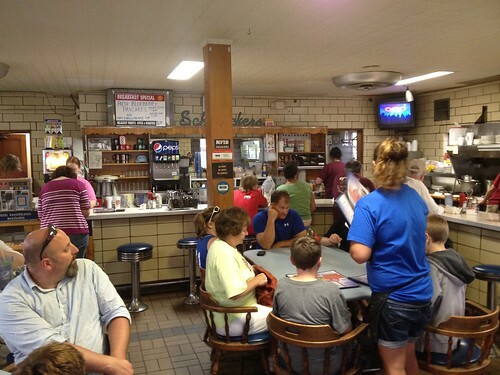 I would describe it as one of these places that makes a real effort to make good variations of traditional fare, with an emphasis on fresh, local ingredients - but there are many such places, so those virtues are not sufficient to delight me. But writing that makes me feel harsh and critical. There was nothing wrong with our meal and much that was good - but choosing that phrasing means that my praise seems faint and halfhearted. 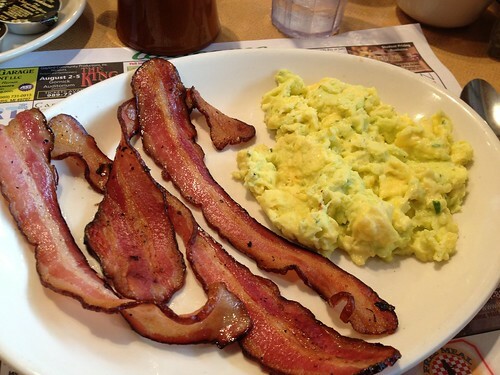 I got the English-style eggs (scrambled with cream cheese and herbs), which came with some really excellent bacon. 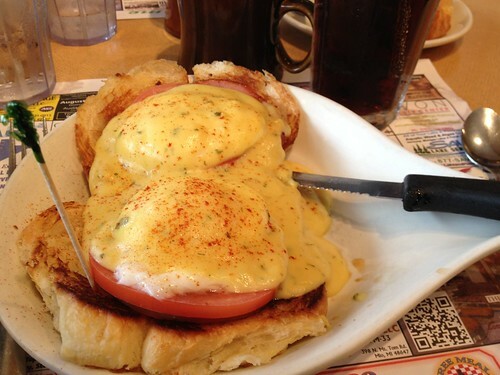 Lori got the Diana's Benedict, which was served on a toasted croissant. 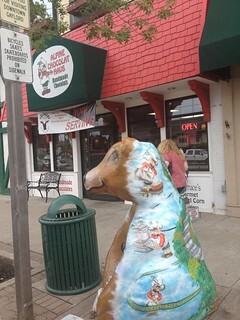 I paused as we went in to Alpine Chocolate Haus to take a picture of a festively painted cow. 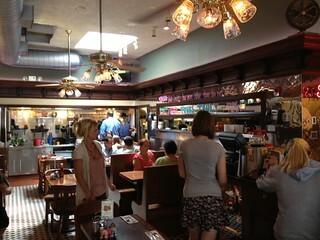 Unfortunately, Alpine Chocolate Haus was not particularly noteworthy. 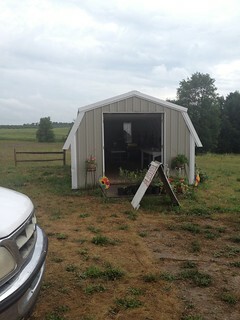 I stopped at a small farm stand in hopes of buying some cherries to snack on, but they had no cherries. 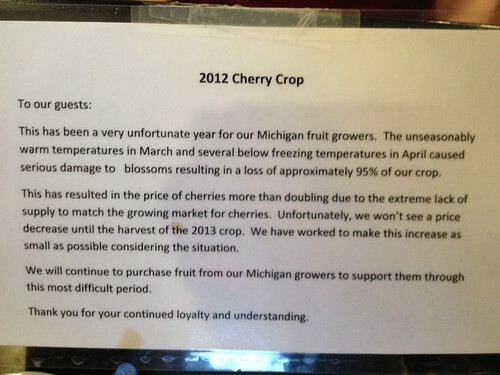 It was a few weeks after peak cherry season, but I had thought there would be some for sale. We bought some blueberries and blackberries in consolation. 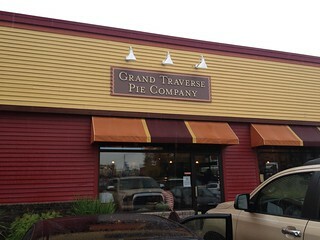 I'm rather surprised that this picture of the storefront of the Grand Traverse Pie Company came out so clear, because my memory says that it was bucketing down rain when we arrived, such that Lori entertained second thoughts about leaving the car before dashing pell-mell through the rain to the door. 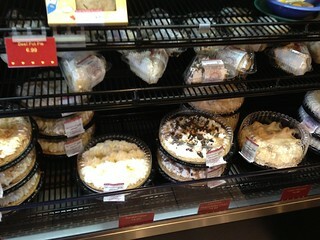 I chose the cherry pie. 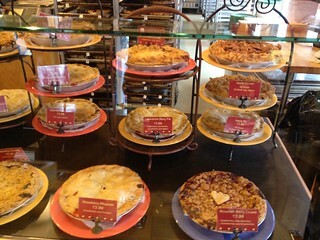 Now, we had had a lot of great pie on this trip, and we had gone to the Stockholm Pie Company, which pie gourmand buffetbuster considers the best pie anywhere. 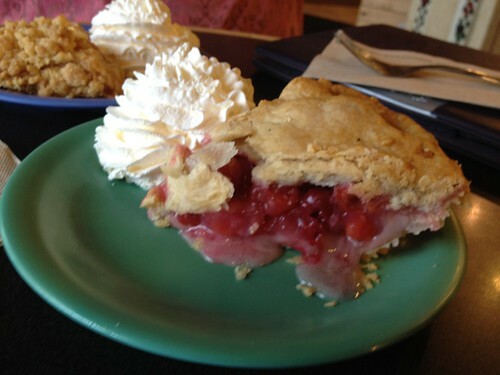 But when I think back to the pies of this trip, the one whose memory makes me salivate most is this amazing cherry pie. 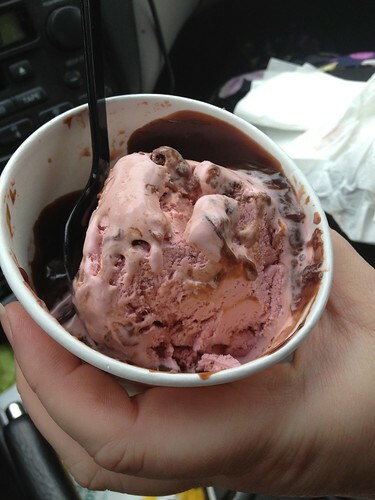 It was simply bursting with a long fanfare of bright cherry flavor. 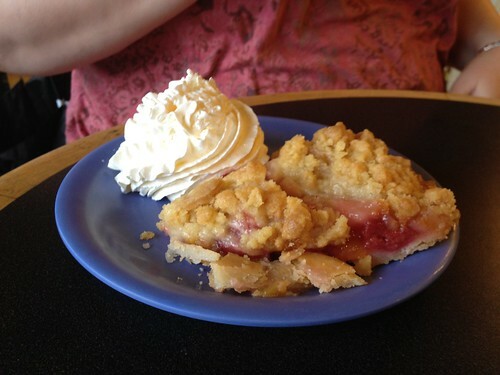 Lori's choice was the cherry-peach crumb pie. It was also excellent, with a very crisp crumb topping. 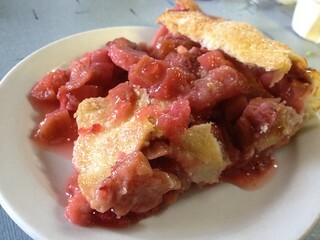 But to my tongue, its excellence didn't come close to the cherry pie. 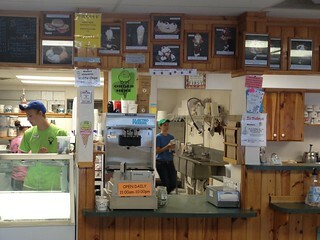 We noticed one more Roadfood-listed place in Traverse City, so we detoured to Moomer's Homemade Ice Cream. 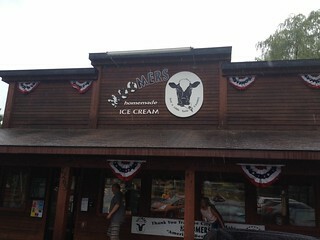 I passed on ice cream, but Lori quite liked hers. The drive through Toledo marked our return to interstates and traffic. We were half an hour late for our dinner with Alex. 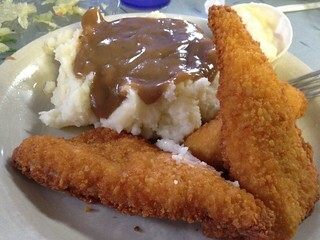 I ordered the lake perch and ended up disappointed; the flavor was so mild that it hardly had any taste at all. 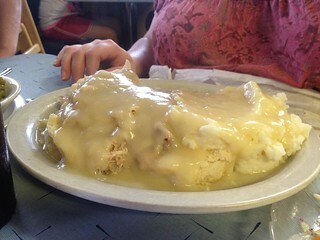 Lori's chicken and biscuits looked and tasted very bland. 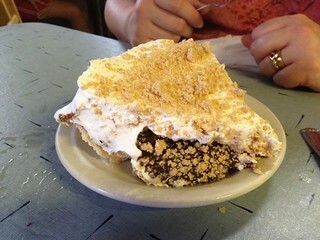 I ordered the strawberry-rhubarb pie, Lori ordered the chocolate peanut butter pie. 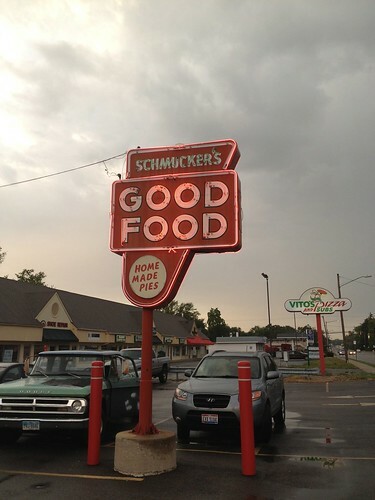 Overall, I was fairly disappointed with Schmucker's, but Lori was significantly more positive. We decided to press on to Cleveland for the night. Driving I-80 across Ohio was great for driving, but bad for scenery; there were tall barriers on both sides of the road, so driving it felt like a hundred miles of the gutter of a bowling alley. 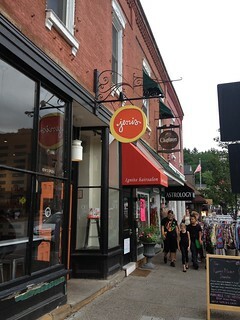 We ate breakfast at a restaurant called Yours Truly in Chagrin Falls, because it was close to a location of Jeni's Splendid Ice Creams. We were surprised (one pleasantly, one somewhat less so) to discover that there was a street festival going on in Chagrin Falls while we were there. 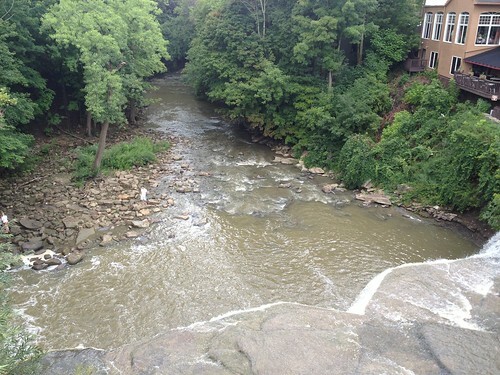 The falls for which Chagrin Falls is named. They're really quite pretty. We could quote my description of Diana's Delights and apply it to Yours Truly with the addition of a few tattoos. We got the Farmer's Market Sundae, with lemon-blueberry yogurt and berries soaked in sugar and port wine. It was very good, but I think it's definitely one of my least favorite orders from Jeni's. We drove on to Edinboro for a reunion with one of Lori's favorite theater professors from her time at the university there, and several of the people she performed with. It was a pleasant gathering; even I enjoyed the conversation without previous knowledge of most of the people. Dinner came from John's Pizza, about which I have little pleasant to say. 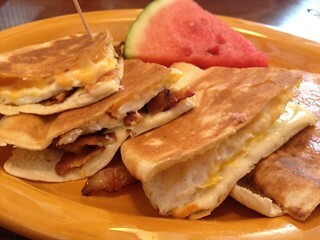 I've only visited Edinboro a few times, but so far, Edinboro has presented itself to me culinarily as a reminder that not every little town has hidden gems, and good places really are to be celebrated. We'd planned to spend the night in Edinboro, but we couldn't find a hotel room at a reasonable price. And at some point, we realized that driving another two hours to sleep in our own bed was far more appealing than any hotel. We arrived home after midnight, but it was definitely the right choice.